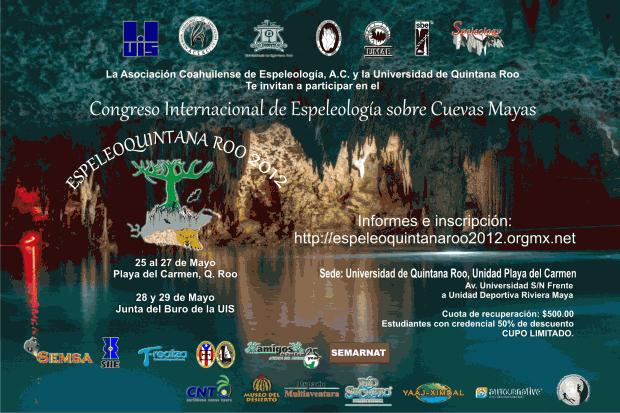 The International Congress of Speleology on Mayan Caves will take place this May in Quintana Roo, Mexico. The event will focusing on how ancient Maya lived with karst as well as the current issues faced by people living in area. It will feature training workshops and other activities, although the final program is still in development. Organized by the Coahuila Association of Speleology and University of Quintana Roo the event will be held from May 25th to 27th, 2012 in Playa del Carmen, Quintana Roo, Mexico. Members from the governing board of the International Union of Speleology (UIS) will be participating in the conference. Immediately after, on May 28th and 29th, they will convene their own meeting, the first time in Mexico. In addition, the Federation of Latin American and Caribbean Speleological Associations (FEALC), Mexican Union of Speleological Groups (UMAE), Mexico’s National Commission on Cave Diving and Speleology (FMAS), and the Brazilian Speleological Society (SBE) will represented at the conference, providing an excellent opportunity to connect between speloelogical group. For more information and to register, visit espeleoquintanaroo2012.orgmx.net.